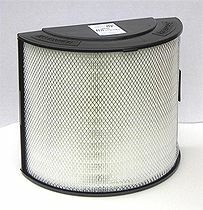 Bionaire BAPF58 HEPA filter is a Genuine OEM Bionaire Filter. BAPF58 HEPA Filter fits BAP580. Bionaire BAPF58 HEPA filter traps microscopic allergens and dust. Filter Efficiency is over 99.97 % at 0.3 micron. Filter Dimensions, inch. 14.4 x 13 x 7.3. Bionaire BAPF58 HEPA Filter comes 1 per pack. Save up to 50% on Delivery Charges* when Order a Pack of 2 Bionaire BAPF58 HEPA Filters. BAPF58 x 2 Bionaire BAPF58 HEPA Filter. Bionaire BAPF97 Carbon Filter complements Bionaire BAPF58 HEPA Filter.